There is not much more satisfying than a big pot of meatballs and homemade tomato sauce on a Sunday. This recipe has evolved much over the years. Originally, the recipe used many more ingredients and took a lot more time and effort. Our cooking philosophy lately, however, has focused on simplicity and obtaining the most flavor from fewer, higher quality ingredients. 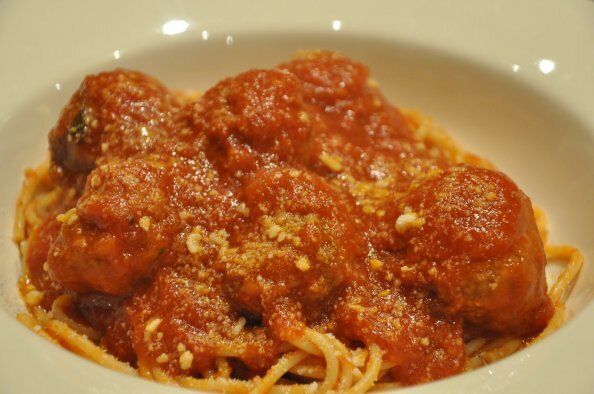 There are many recipes for meatballs in sauce, and this is our favorite. It also makes for great, freeze-able leftover portions — either for Kelly to heat up some night when I’m out of town for work, or for delicious (and really easy) meatball pizza later in the same week. 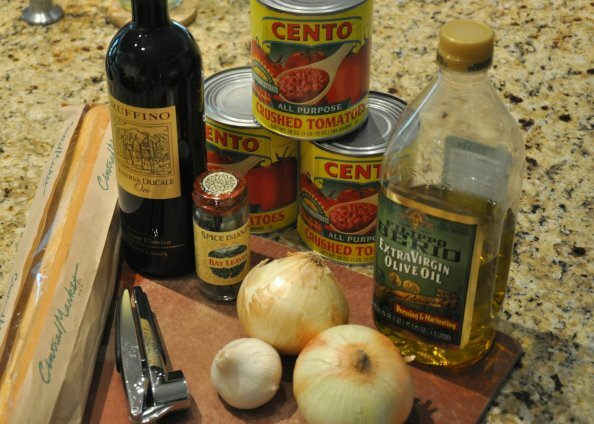 Simple ingredients for our favorite Sunday Sauce. 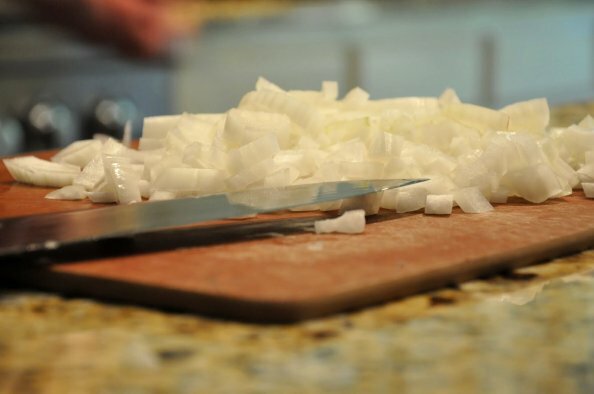 Start with cooking the chopped onions. Softened onions, garlic, red wine and bay leaves. The canned, crushed tomatoes go in next. Meatball ingredients. Chief ingredient = meat. The meatball ingredient mixture is almost fully combined. 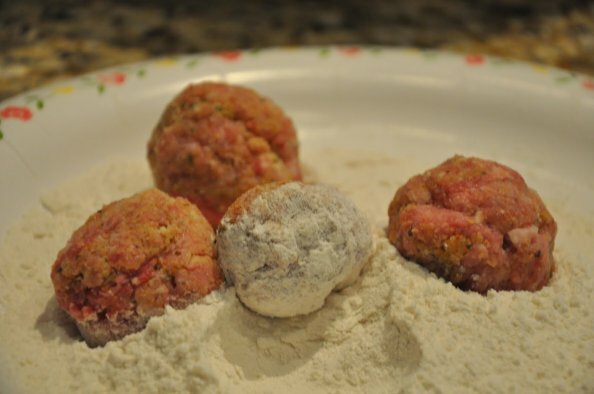 Here are the meatballs, ready to dredge in flour, which adds a tiny bit of crisp coating when you bake them. Making smaller-sized meatballs means you get to eat more of them. Cooking the meatballs in the oven before you put them in the sauce adds to their flavor and keeps them more firm in the sauce. Gently add the meatballs to the sauce and simmer uncovered for at least an hour — two is even better. After the first half hour, stir occasionally, VERY GENTLY, so as not to break up the meatball goodness. 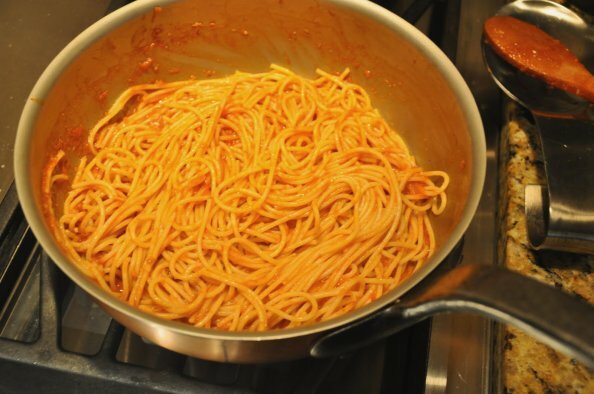 We like to add a bit of the red sauce to the pasta right after it is done cooking and has been drained. This helps to infuse the pasta with the sauce, making it even more delicious. Spoon the meatballs and sauce over the pasta. Kelly also likes it with some fresh parmesan on top. Buon Appetito! Heat a large pot over medium heat. Add 2T of olive oil, and when the oil is hot, add the onion and sauté for approximately 5 minutes, stirring occasionally. Add the garlic, stir well, and sauté for a minute. 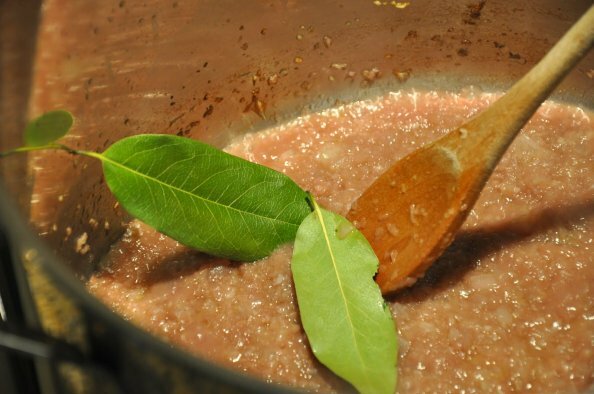 Add a splash of red wine and the bay leaves, stir and cook for a minute. Add the tomatoes and half a can of water, stir well and cover. 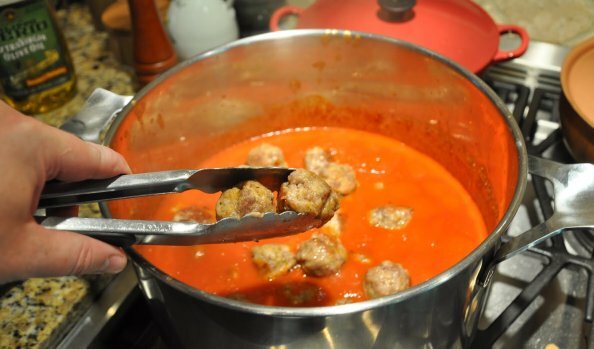 When the sauce heats back up to bubbling, reduce heat to low and continue to cook on low while you assemble the meatballs. Preheat the oven to 350 degrees. Crack the eggs into a large bowl and beat lightly with a fork. 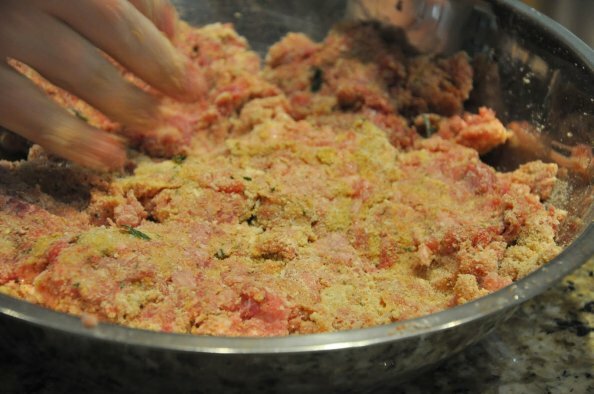 Add the remaining meatball ingredients and a generous amount of salt and pepper, and mix it all together with your hands until the ingredients are just combined, without over-mixing. 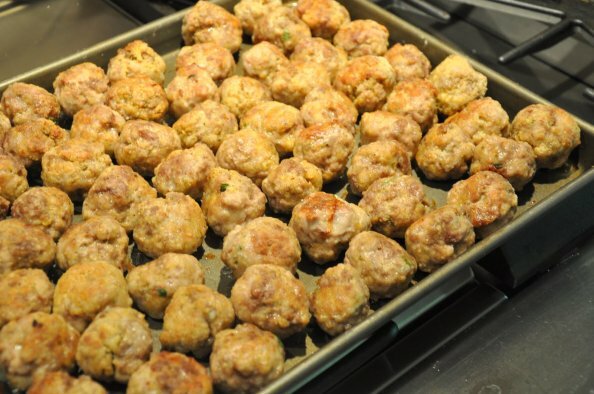 Shape the meat mixture into golf ball-sized balls, dredge them LIGHTLY in flour, shake off the excess, and place them on a cookie sheet coated with 2T of olive oil. 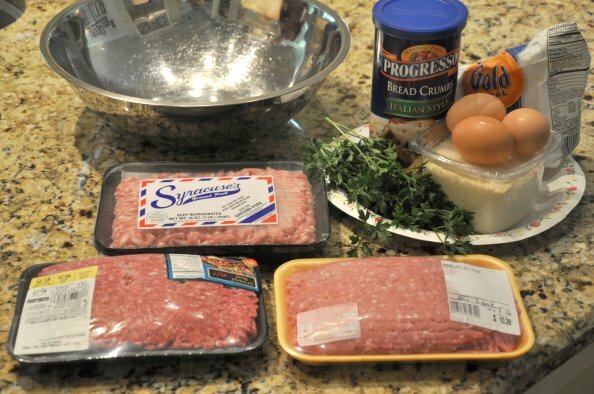 Bake the meatballs in the oven until browned on all sides, turning the meatballs to brown them evenly, approximately 30 minutes total. Add the meatballs to the sauce, and cook for at least an hour in the sauce. Thanks! Sean did an amazing job setting everything up for us. We love it! Awesome! 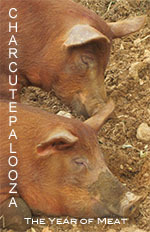 Also, check out http://www.allisonfarm.com. This is a distant cousin of ours. Awesome blog!! I was so happy to hear that you two were doing this. I will be your favorite fan!!!! 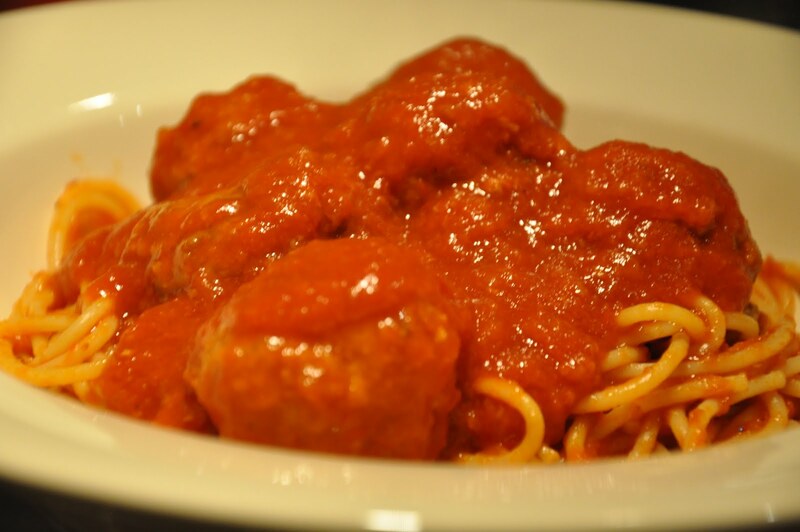 Also, we love the meatball and sauce recipe! I have been making the sauce since you shared the recipe with me years ago. I love to make a ton and freeze it. In fact, I can’t remember the last time I bought jarred sauce..yuck!!! Thanks Jen! We’re so glad you like the blog! Dan “the man” this site is great!!! I have a couple of venison things for you if you want them!! Thanks Adam! We hope to post a recipe for “dan the man” grilling rub soon!